A TODAY Food writer and recipe developer shared how changing up her breakfast routine helped her become much healthier. When people find out I'm a food writer and recipe developer, the first thing they ask is always "How do you not weigh 500 pounds?" It's a valid question, and one I couldn't always answer honestly as I watched the numbers on my bathroom scale slowly creep higher. I was on a slippery slope of snacking too much on the wrong things, not paying attention to how much I was eating over the course of the day, not leaving my kitchen for hours — a toxic combination of habits that affected my health for the worse. I made a big resolution. I formed a tough-love plan to overhaul my entire eating routine. And I had to start with breakfast. When I tell you I was obsessed with boxed cereal, I'm sure you can understand. From childhood through college through single apartment life and suburban Costco runs, it was my food crutch for pretty much any meal of the day. A bowl of shredded wheat in the morning, a bowl of cornflakes before bed — just a little something comforting to curb the cravings. But the problem with eating so much packaged cereal is that it wasn't keeping me full at all. Sure, I could eat cereals with whole grains and eschew those with too much sugar, but it wouldn't be enough — even if I ate three bowls at a sitting, which is not a good portion control solution! Now I have a new breakfast routine, full of protein and fiber to fill me up, bring my energy levels up, and keep my snack cravings at bay. 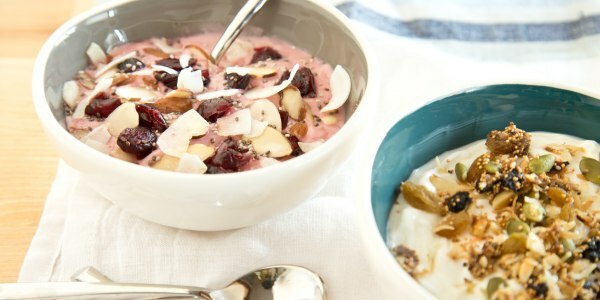 I created a pantry "breakfast shelf" of nuts, seeds, and dried fruit to make parfaits with low-fat plain Greek yogurt. It's readily available, so I have no excuses—sometimes I'll make a big batch of lightly sweetened muesli of nuts, seeds, and fruit for busy weeks, or sometimes I'll throw a little coconut, a few cranberries, maybe some almonds into my yogurt depending on my mood. The best part? This routine works for anyone, no matter what your taste preferences are. Don't like coconut? Don't use it! Allergic to nuts? Stick to seeds like pepitas (hulled pumpkin seeds), sesame seeds, and protein-packed grains like amaranth. You can make your own parfait blend of nuts, seeds, and fruits using the recipe template below. Don't forget to watch your portions — I use a kitchen scale to measure — to keep within recommended calorie counts. Breakfast was the first step in my journey to a healthier lifestyle. I now count calories, work out four to five times a week, and control my portions. I'm 30 pounds lighter, I can run a 10K, I'm so much happier, and I feel like a million bucks. And I credit my breakfast change as key to making this all happen. Breakfast protein (without eggs): Try Joy's chocolate banana oatmeal!